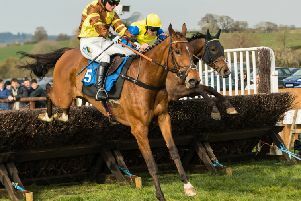 The ground looks likely to be no worse than good to soft at Haydock at the weekend and I fully expect Gold Cup runner up Might Bite to reverse Cheltenham form with winner Native River in the Betfair Chase over three miles. The Nicky Henderson-trained gelding is Evens with BetVictor and I would be disappointed if he didn’t take the first leg of the Jumps Season Triple Crown. Might Bite is 14/1 with BetVictor to win at Haydock and then follow up in the King George over Christmas before going on to Cheltenham Gold Cup glory. If there is to be a Triple Crown winner this season it is the Henderson gelding, but it is a big ask. We highlighted earlier in the week the brilliant performance of Lalor at Cheltenham on Sunday. Kayley Woolacott saddles The Kings Writ (3.20) at Chepstow today and the hope is that the seven-year-old can cope with the slight drop back in trip on his seasonal reappearance. The selection ran right-handed exclusively last season but there seems no reason why he shouldn’t be able to cope with this track and the forecast soft ground is ideal. The Philip Hobbs trained Atireligo is a C&D winner who returns from a 600-day absence, but a market move would be worth noting given the form of the yard and the fact that he can run from the same mark as when scoring here in December 2016. Steel Bob is of interest in the 3m Handicap Hurdle, but marginal preference is for Juge Et Parti (12.40) representing owner Dai Walters and Nigel Twiston-Davies. The selection won a good ground Bumper for Christian Williams but has been a beaten favourite in his last three starts over timber. The hope is that this five-year-old just needed time to strengthen up – he has obviously shown a fair bit at home. There is the possibility that My Mate Mark (12.30) will ‘bounce’ after his excellent comeback at Bangor where he finished runner up to Anytime Will Do (rated 132) in receipt of 6lbs coming back from a near 600-day lay-off. The selection won a Bumper at Southwell before finishing tailed off in the 2017 Champion Bumper. Marienstar is 7lbs ‘well-in’ despite carrying a 7lbs penalty for her recent Kempton success and that imposte is negated by Jack Andrews’ 7lbs claim. The mare was the last winner as a conditional jockey for Bryony Frost at Kempton, but she is likely to be a very short price and I am keen to take her on. Black Tulip (1.00) faced a difficult task on her chase debut when third at Worcester behind two higher-rated mares. This intermediate 2m 4f trip is on the sharp side for Henry Daly’s six-year-old but I was impressed with her fencing on debut. At Hexham, it will be disappointing if Hill Sixteen (12.50) doesn’t go very close in the opener, having ran well when third behind a couple of decent sorts at Carlisle earlier in the month. The selection cost owner Trevor Hemmings’ £100,000 after winning a point back in the spring and he jumped out to his left at Carlisle – today’s track should be ideal. Donna’s Diamond would be giving weight away all-round if this were a handicap hurdle, but I am looking forward to the chase debut of Senor Lombardy (1.20) who won his sole point in his native Ireland and is a novice of some potential for Keith Dalgleish.